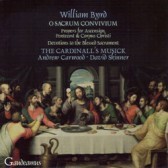 The ninth disc in the Byrd series is devoted entirely to settings from the Gradualia publications of 1605 and 1607, and provides a wonderful set of music for the three consecutive feasts of Ascension, Pentecost and Corpus Christi. These motets are shorter than those published in the late 1580s and are perhaps more imaginative witty, sometimes playful (Factus est repente) but sometimes highly devotional (as in the world famous Ave verum corpus). For this disc the female singers of The Cardinall’s Musick have been given a holiday, thus allowing the lower voices to show off their versatility and musical imaginations. Also here is the first of the liturgical units from the Gradualia publications which starts at the beginning of the liturgical year with the 5-part settings for Lady Mass in Advent and the witty Marian antiphon, Alma redemptoris mater.